Have you changed your stock tires ?? What are the effects on mileage now ? As your mileage was superb u mentioned in your posts ! I have spacers in my vitz, with stock tyres atm. How much it had been cost (Original Buying price in Yen) and total cost ? I do not know which oil grade / viscosity had been in use, in your vehicle? In mine, it was 0w-20 from Japan (I have also attached a picture above, showing a sticker where 0w-20 oil grade has been written) and now, I just poured 5w-30. 0w-20, 5w-20 and 5w-30 are all good, but; never pour any oil which has grade / viscosity thicker than 5w-30! Even Atlas Honda is pouring 0w-20 in brand new Civic, City and BRV nowadays. So if 0w-20 can work flawlessly in these models for any region in Pakistan, be it Sibbi, Karachi, Lahore, Sakardu, etc. then for sure, 0w-20 can also work flawlessly in 1KR-FE too, in any temperature and environment here. 5w-30 would be the most safe bet, but ensure that oil is 100% genuine and original. Fake oils destroy engines and they are abundantly available in market. One of my friends bought Total Quartz 9000 Future series 5w-30 from a Total Petrol Pump, but it came out to be Fake, and reduced 1L after driving for 3-4,000 Kms. So even all Total pumps cannot be trusted! 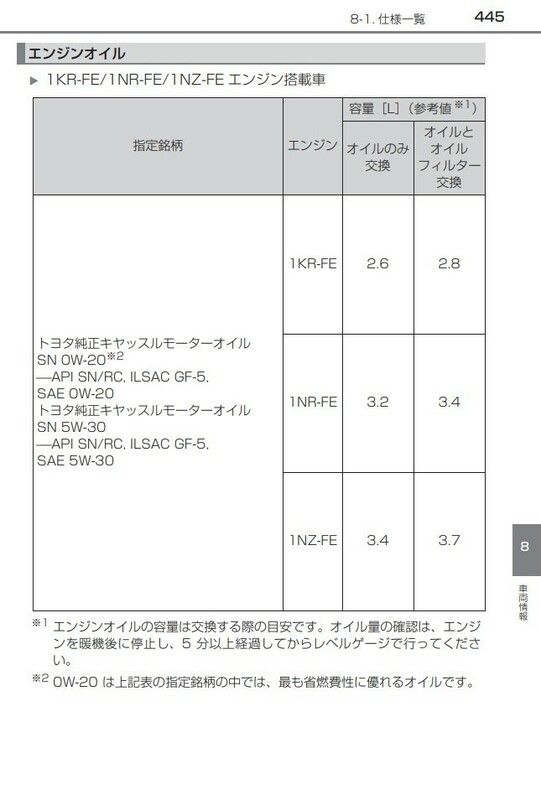 As per latest owners / users manual for JDM Vitz, Quantity of engine oil for 1KR-FE is 2.6L and 2.8L, without filter change and with filter change, respectively. 1L x 3, or 3L pack (although 3L pack by Total in Total Quartz 9000 Future Series is not being currently offered here in Pakistan) would be good enough, but never pour more than 3L! whatever the mechanic / oil change guy says! Change oil along with genuine oil filter after every 5,000 Kms, and always keep air filter neat and clean. Replace when deemed necessary. 35 psi pressure would be wonderful, however, if you feel that your ride has become bumpy or noisy, etc. you may reduce tire pressure. Do share your experience on 35 psi here, and also mind sharing your city, drive conditions, and no. of persons in car, etc.? High pressure may not matter in soft tires, however, in case of hard tires, or tires become hard for one reason or the other (as some people say for General tires), then using high air pressure in tires can make the ride quite bumpy and unpleasant. Regarding tire size, well, if 15" up-sizing is not possible and spacer springs / packing is inevitable, then you may go for 185/70/R14, however, first confirm that whether it will easily fit on your genuine, OEM Rims or not, and not create any problems regarding maneuvering, or touch the body of your car? One of my friends own 2nd generation Vitz, and he has packing along with 185 mm wide tires (I do not remember the exact specs, but 185 mm width of tire is confirm). I recently came to know through him that the tires touch his car's body (despite spacer springs), and I was surprised. So first confirm, and then also share your experience here. I just studied today that like tires widths and dias., rims also have specific widths and dias. and if going for 14" size of tire, it does not mean that irrespective of tire specs, any 14" tire will fit on any 14" rim. Many different factors have to be considered! Even 14" rims have different widths like 4.5", 5", or 5.5" (please check, what is the width of your stock, OEM rims?). If a 14" tire requires width of 14" rim to be 5.5", it may not fit on a rim with width of 5", or may make ride extremely unpleasant, or may be dangerous. So, you too do some homework before proceeding for tires changing. due to a constraint i am sticking with 14" Rim for now. Atleast for an year. It's OK brother. No problem. You can switch whenever you feel comfortable. Its your ride, your money and your decision. You know your conditions better than me. how much some adequate 15" rim will cost ?? A guy gave me an estimate of tentatively 35-40,000 PKR for reasonable, good quality, alloy rims in 15" size, and total cost along with change of rims and good quality, reasonable, imported tires (non-smuggled, custom duties and taxes paid and with warranty) would be somewhere 70-80,000 PKR. trusted thing with max satisfaction. "Ghar ki bat hai"
Chalein, that's great and wonderful! Color:- Pearl White. Auction grade 3.5 B/C, clean to the extent it can be quoted 4.5 B/B 26000 Kms driven. Original. You made a very wise and right decision! For sure, I will be anxiously waiting. My pleasure and you are always Welcome! Can you tell me a place in Isb, although i know some, where i can get Genuine 100% OEM parts ?? Yousaf Autos, Mehran Autos, Imran Autos, Hamza Younas Automobiles, etc. I do not remember from where I bought air filters, however, it was somewhere from Salman Autos, Raja Autos or Autos Center, etc. Just visit the market, and visit at least 2-3 stores. You will get idea about stores and prices. OR... visit 2-3 shops which sell other parts, and ask them from where can I buy genuine filters, plugs, etc. for Toyota Vitz, 2015 model? 1-2 shopkeepers will guide you to the very same shop(s). You can visit and buy items from there. couldn't find a OEM air filter this morning from Total pump F8 Markaz. If genuine, OEM Air Filter and AC / Cabin filter is not available, you may go for Leppon! but still, ensure that it is also original. Or go straight to Toyota and get the works done ?? I would never advise, unless / until you have abundant money. Parts, service is extremely expensive there. Nope. I have not changed them yet, however, I plan on changing them ASAP, IN SHA ALLAH. I recently come to know that tread of all the 4 tires have developed severe cracks, and its quite dangerous. I just checked the auction sheet of my ride. With tires, 2 has been written. Tires score is usually from 9 to 1. 9 means, tires in best condition, and 1 means, tires in worst condition. Again salute to the honesty of my Importer and Japanese auction house as nothing was changed / replaced by them. One thing is clear, tires were the same at the time of auction (i.e. in bad condition) and not changed afterwards. My mileage is AL HAM DU LILLAH the same as I had mentioned in my posts above. No effect, since I have not changed anything till day. Tires, rims are the very same. TP is 35 psi since long. Dear friends, if you are from Rawalpindi / Islamabad area and want to buy tires and / or rims for your ride(s), you can visit Malik Enterprises, Kashmir Road, Rawalpindi Saddar. The guy there is Ali Malik. Very honest, and guides to the best possible extent. I changed the tires of my ex-ride Passo from there, and had been extremely satisfied. He is knowledgeable, and I had good experience with him. Whenever I change tires and / or rims for my Vitz IN SHA ALLAH, I may again visit him. He is recommended! You can google for more details about this store. Please guide about the stores, which sell non-smuggled, custom duties and all the taxes paid tires, with warranty, and at reasonable prices. Suggestions near PWD Society, Bahria Town, GT Road, Blue Area, etc. would be highly appreciated. Had been carrying out all the preventive / periodic maintenance related works of my ex-ride Passo from there (For Vitz, I have not felt the need yet, so have not visited them). They have knowledge and experience. In fact, Ali Malik from Malik Enterprises recommended me this garage (He owns an Audi, but carries out all the maintenance related works of his ride from there). Competent mechanics, and most importantly, they have proper tools to carryout the tasks and listen to all the problems of the client with complete patience. Even if you ask them the same thing 10 times, they will never get annoyed and angry, and listen to the issues with complete patience. Again, I would recommend it, being their happy and satisfied customer! If you have other recommendations, please do share. 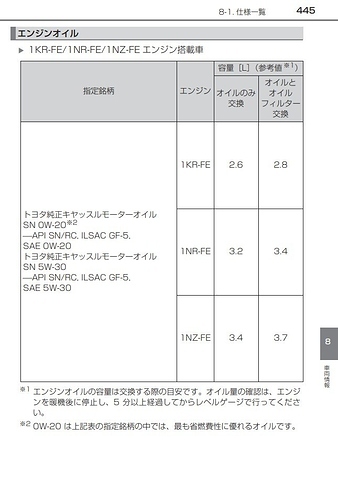 Please see that either the engine is 1.0L, 1.3L or 1.5L (all are Non-Hybrid variants of Vitz), the oil grade is 0w-20 or 5w-30, and API SN (or SN Plus I would say, as is now the current standard) / RC (resource conserving), and / or ILSAC GF-5. The quantity of oil reqd. with oil filter change is 2.8L for 1KR-FE in Vitz. @adnan.shaukat Please refer to Basit's above messages. It includes all rates. Similar are mine. Bro i live in Islamabad. I use fuel of Attock Petrol Stations. And i am thinking to try Attock Lubes as well. Atm i am getting 16 km/Ltr from my ride n trend in increasing upwards slowly. As far as Total Fake lubes story u have mentioned. This is bizarre, Pakistani market is full of fraudulent things. Sir idr log ghada aur kutta karhae khila dete hain. Toh do u expect they will care about your car lubes. ?? When they can play with your Life, then ride is nothing for them. So it means 35 psi can work with worst/bad condition tyres as well. I will get my TP accordingly then. You must change the tyres if you have got them inspected. City is Islamabad, travel on Kashmir Highway then park road or Kashmir Highway to Secretariat mostly. Max persons on board are 2. Except on weekends. Will share 35 psi experience after pumping it. You are right always homework is needed to get a work done. Today a mechanic at Total F8 said me 4L oil in Vitz haha. My cousin has 2nd gen vitz. He is using 185/65/R14 without spacers. He faces ground clearances often but no case of tyres touching the body. I would suggest to prefer Shell and Total; company operated and maintained fuel stations. No doubt, Attock is equally good. Before going for Attock lubes, check and verify that whether they match or exceed OEM recommendations or not? I thinking, it is quite good and reasonable fuel efficiency. Keep it cleaned periodically, preferably after a week or 2, by blowing compressed, pressurized air on it to remove any / all the dust particles, etc.